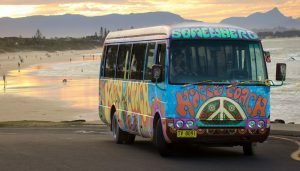 Top 10 Things to Do in Byron Bay – The Highlight of East Coast Australia! Byron Bay is one of the most popular stops on the East Coast trail, and when you get there, you’ll see why. Stunning beaches, laid back people, and the barefoot hippie vibes are just a few of the things about Byron that will make you want to stick around. There’s also a whole heap of awesome ways to spend your time. 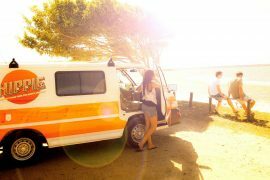 So whether you’re staying for a few days or a few months, check out our favourite things to do in Byron Bay, and make the most of your time in this epic little town. 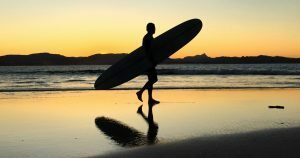 Byron Bay is well known as one of the oldest and best surf towns in the world. Whether you’ve never surfed before, or shred with the best of them, paddling out here is a must-do. Crystal clear water and perfect waves all year round make the surf spots in Byron a playground for everyone from complete beginners, to pro surfers. 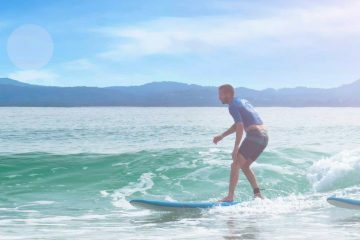 If you want to learn to surf in Byron Bay there’s a great choice of surf schools in town where an experienced surf instructor can help you get you up and riding in a day, plus loads more surf shops for board and wetsuit hire if you already know what you’re doing. You can’t miss that Byron has a cool, hippie vibe going on, but Nimbin takes it to a whole new level. About an hour and 45 minutes outside of Byron, Nimbin is a village full of quirky, colourful shops, funky cafes, and some other plant based activities! Lots of it! It’s not everyone’s cup of tea, but if you’re into the alternative scene, it’s worth a visit. 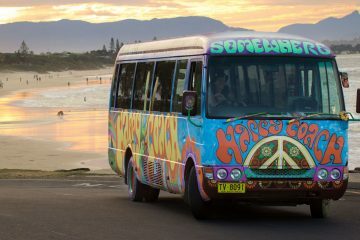 It’s also a good opportunity to explore the beautiful Byron Bay Hinterland on the drive out and a day trip to Nimbin will include some amazing scenic stop offs. 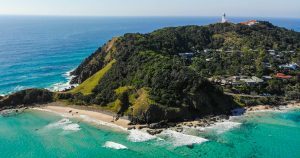 Cape Byron Marine Park is made up of a selection of reefs, Julian Rocks, and the coastline that runs the eastern side of Byron Bay. Protected from the rough waters of the open ocean, Byron plays host to a rich and diverse selection of marine life, including its own resident pod of dolphins. Getting out on the water in a sea kayak is one of the best ways to get a close up view of these incredible animals. 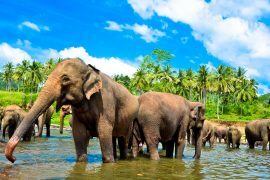 Depending on the time of year, you might also be lucky enough to have close encounters with humpback whales, turtles, and manta rays. The perfect way to start a lazy Sunday, grab a coffee and wander around Byron’s Community Market. Take your time to explore the huge collection of artworks, handcrafted goods, and locally-grown produce, while listening to live music and enjoying some of the best food and drink from the Byronshire area. The market is held at Butler Street reserve on the 1st Sunday of every month from 8am. As well as the monthly market, you can also munch your way around the weekly farmers market in the same location, every Thursday morning from 8am. You’ll find organic and locally grown fruits and vegetables, alongside local specialities like honey, olives, artisan bread, macadamia nuts, and freshly squeezed cane juice. Our advice: go with a full wallet and an empty stomach! 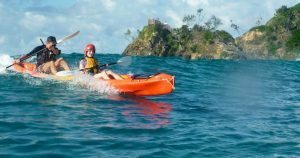 Byron Bay is located where the warm waters of the north, meet the cooler waters of the south, making it home to a vast array of both tropical and cold water marine life. 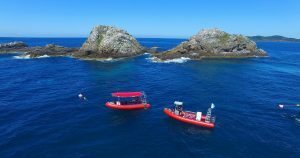 Julian Rocks, five minutes off the coast of Byron, is renowned as one of the top dive sites in Australia and a scuba dive at Julian Rocks is well worth doing. At different times of year, you’ll find leopard sharks, manta rays, turtles, and the endangered grey nurse shark, as well as an abundance of colourful tropical fish. 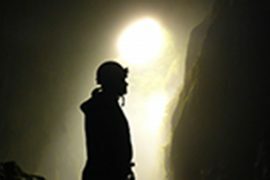 If you’re not into diving, the site is also incredible for a snorkelling adventure. For a relatively small town, Byron isn’t short of places to have a drink! Whether you prefer a beer overlooking the ocean, sipping on fancy cocktails, or a night of live music, you’ll find something that hits the spot. The Railway Hotel (or ‘the Rails’ as it’s affectionately known) is located in Byron’s now defunct train station and has live music most nights of the week. The Great Northern Hotel (‘the Northern’) is the home of Stone & Wood, Byron’s local brew, and is another great place for live music. They often host some big name bands too so keep an eye on what’s coming up. The Beach Hotel (‘the Beachie’) has a prime spot right on the seafront and is a great place to grab a sunset beer, plus they also have live music on a Sunday. If you want to party into the early hours, check out Woody’s Surf Shack for a vintage surf vibe, and Cheeky Monkeys, the home of Byron’s backpacker party scene. Whether you’re a morning person or not, make sure you get up to Cape Byron Lighthouse to see the sunrise at least once during your trip. Cape Byron is the most easterly point in Australia and sunrise from here is pretty spectacular. Watch the sun come straight up out of the ocean, as the surrounding landscape gradually catches the light. Between May and November you might even have some humpback whales for company. It’s hard not to become a beach bum when you’re surrounded by so many beautiful beaches in and around Byron. Main Beach is, unsurprisingly, the main beach in town and is a great place to watch the sunset. In the next bay south is Wategos; smaller but sheltered and a popular hangout for dolphins. Then to the south again is Tallows; a huge, wild expanse of sand and ocean. You definitely aren’t short of spots to lay your beach towel! For the very best views of Byron, try jumping out of a plane at 15,000 feet. Ok, this one might not be for everyone! 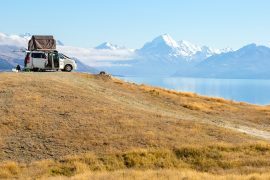 But for those who dare, you’ll be rewarded with the spectacular image of lush, green jungle sprawling out to meet Byron’s famous beaches, and the vast turquoise ocean beyond. 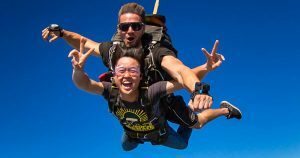 So why not Skydive in Byron Bay and tick it off your bucket list! You might have gathered by now that Byron Bay is a pretty good location to spot whales. 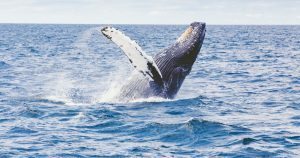 Between the months of May and November, humpback whales can be spotted off the coast of Byron as they make their way north from Antarctica, to their breeding grounds in the subtropics, and then again as they return with their young – making whale watching in Byron Bay one of the best spots in the country. You can often catch a glimpse of these amazing creatures from the shore, but for a closer encounter, take a whale watching tour. Some boats even have a hydrophone on board so you can listen to the whale song. 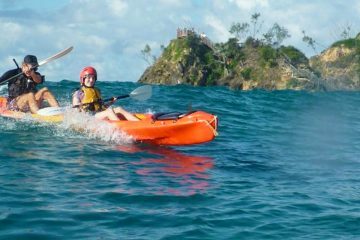 What are your favourite Byron Bay activities? So that’s our top 10, but of course there are heaps more things to do in Byron Bay. Share the love and let us know what your favourites are in the comments below! For more inspiration, check out our Byron Bay Tours and Day Trips and start planning your adventure now. 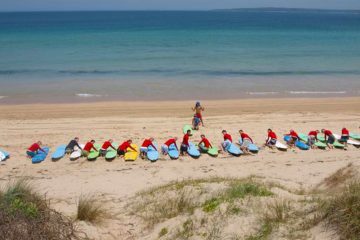 Next postSurf Camp Australia – Where to Hit the Waves Down Under! Introducing The New Greyhound WHIMit & Accomodation Package Deals!